And here is why you should not work on a piece of jewelry when you are tired or distracted! LOL... 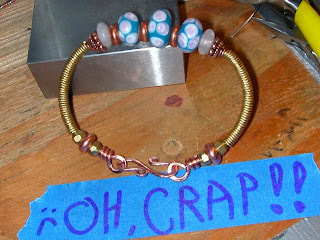 I was quite pleased with this bracelet, as the tube coils noodles are made of recycled brass wire that I very patiently salvaged from several other items that were practice or didn't come out right... I straightened out the wire and twisted it and then coiled it. I am really gung ho! on recycling items to keep useful things out of our landfill and I belong to the local Portland Freecycle group, so I was feeling all warm fuzzy and pleased when I noticed I neglected to put 1 spacer bead on between the rose quartz rondell and the end lampwork focal bead! Slaps self in head... Thwack! So now I get to do it over again... ROFLMAO! Well live and definitely learn to Double Check before I make the end eye hook, .